Example: In this example Isabelle has updated her supporters on the progress of her campaign to get her son the autism care he needs, she also encouraged signers to continue to share the petition. Ask your supporters to help your campaign in some other way, like donating to a Crowdfunder, posting on the decision maker’s Facebook page, or tweeting at them. Example: Ben Lyons encouraged his supporters to donate money to Medecins Sans Frontieres in his petition asking the FA to donate the profits of the England France friendly to the charity. Example: Stevie asked her supporters to comment on Boots’ Facebook page during her campaign to adjust their ‘sexist’ prices. After looking at the Brits 2016 nominations, Anant felt the lack of diversity of the nominees wasn’t reflective of the industry. Jumping on the #OscarsSoWhite hashtag, Anant produced #BritsSoWhite to reflect the ‘whitewash’ at the Brit Awards. The industry took notice, and the awards ceremony responded to Anant's petition announcing that “diversity was not reflected at this year’s ceremony”. 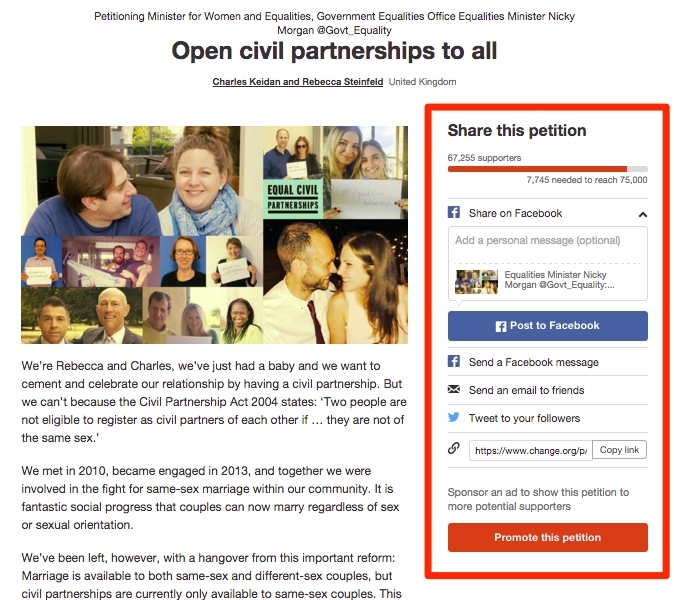 The title of your petition automatically generates as a tweet or Facebook headline when people share your petition. Sometimes your petition title might work for the petition, but may be too long or not make as much sense on social media platforms. It can be a great idea to try and customise your headline for sharing. Here you can adjust your title, add in your decision makers twitter handle, or even include a hashtag and really bring your petition to people’s attention. Rosie has included her decision maker’s twitter handle in the headline for sharing. She also includes two hashtags for her campaign to create a law to protect models.